The coldest day and night of the season is upon us. The thermometer says zero as I write. The overnight low is expected to be minus 15 degrees F. The snow crunches under my feet and my fingers stiffen in my gloves… Baby it’s cold outside! I really like winter. The whole ice and snow thing thrills me. The starlit sky tonight looked awesome as I went about evening chores. 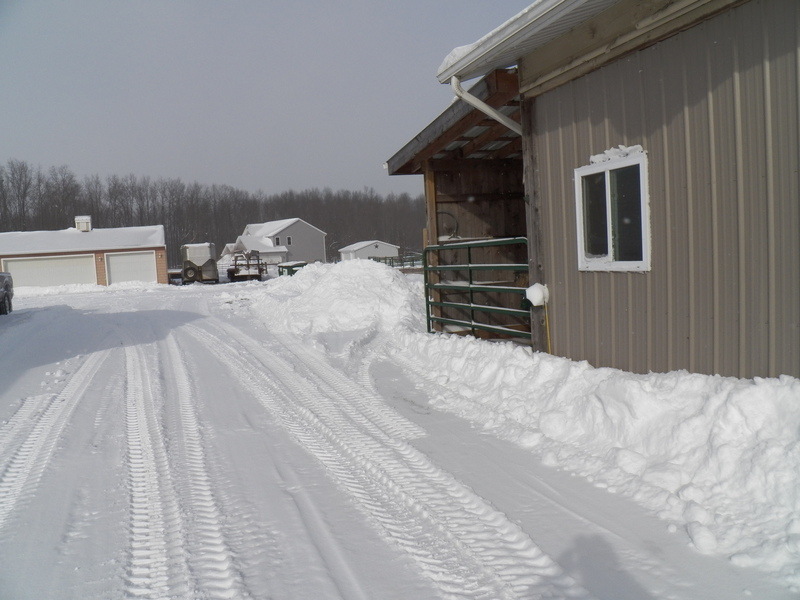 The horses ran around and played a little on the snow covered feedlot, but did not hesitate when it was time to come in. This cold snap makes it a tough job keeping all the animal’s water thawed. I have a tank heater that works overtime to keep things de-iced. I dip water from the tank to water the rest of the animals. I have to swing gates so the cattle can drink from here free choice too, but it all works out. I also keep a spare tank heater, just in case. It has proven a good thing to do. The one that I am using always breaks during a cold snap or when I’m working my off-farm job. There is peace of mind having a few spare parts! I have a plan and design for a solar powered chicken water heater. I just need some time to build it and a few solar pieces to make it all work. The hens will be grateful. I carry warm water to them twice a day, but nothing says refreshment like free choice! We are bracing for another dip below zero. The snow is quite deep and drifts abound. The wind howls and rattles many things. The piggies are all buried in straw, snug and warm. The cows are in their shelter and only peak out to see what I’m up to, but keep chewing their cuds as they lay on a straw bed. Yesterday was another cold and windy day. I plowed the drive after doing morning chores. 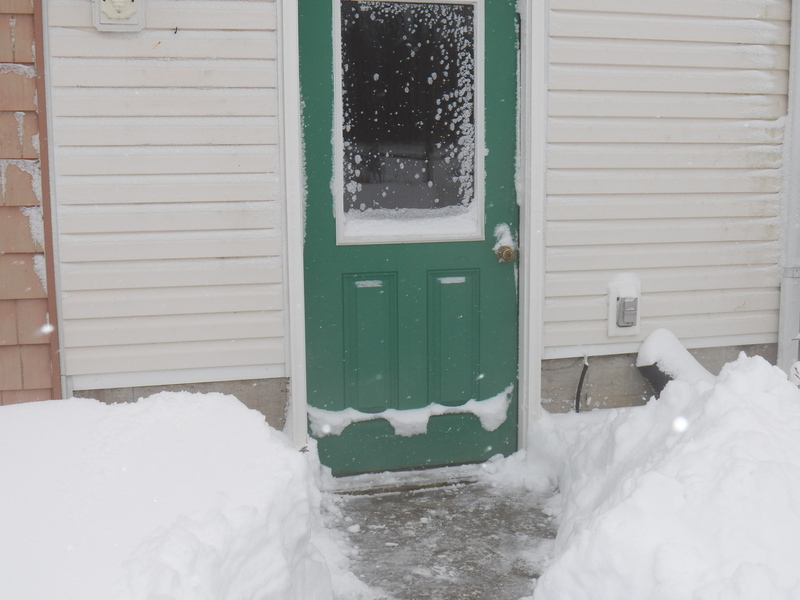 It wasn’t too bad, just a few drifts, but it was very cold. I finished that job and came in to warm up. I lingered a bit. I even got my hair cut. I found a warm spot on the couch, where I read and watched some TV. Just after dark, my son came in and said he was going to plow the drive. I told him not to worry, that I had already done it once. He told me that it snowed a lot. I just grinned, because from my warm vantage point on the couch, I had watched it snow, but mostly just blow… or so I thought! I convinced my son to eat supper with us, before going out and I would go with him. We ate, then dressed to go outside. I could not believe what awaited us.. It had snowed indeed. 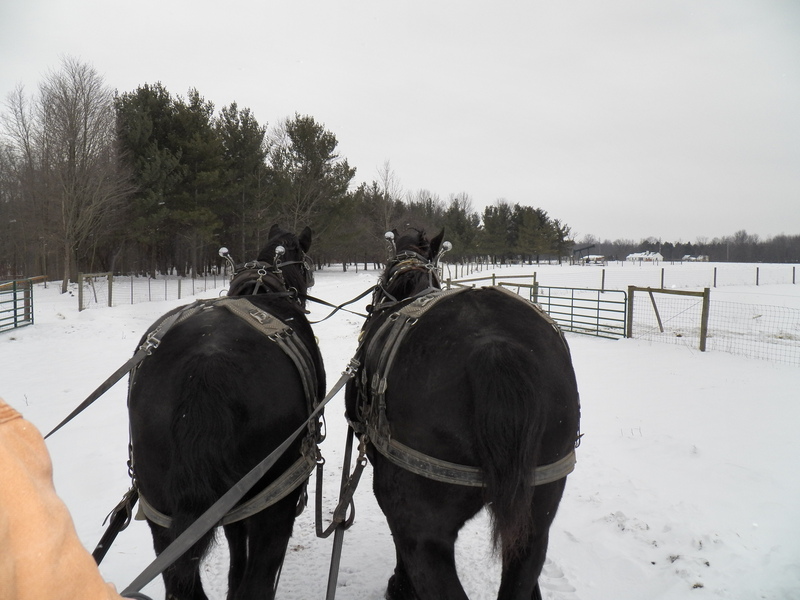 I did chores, then started plowing along with Jake on his 4-wheeler. It took us an hour or so to clear everything out. My hands were frozen! Jake was still going strong. My hands, feet and body were cold. I couldn’t help but wonder when it had all changed? It used to be the boys who whined about the cold and wanted to go inside, but this time it was me. My fingers were numb and stinging … I couldn’t believe it! Yesterday, I had big plans…then I stepped outside. I did get the chores all done. I added bedding to all the pens as the single digit day chilled me to the bone. My cousin helped take hay bales out to the cattle. It was just enough work to realize that better days were coming for some of the work we had planned! Today the wind howls outside, while the snow blows into drifts. The animals are snug and fed and I am having trouble finding any reason to be outside in the cold. I will accomplish a couple of things that have been nagging me, but I plan to take all day to do them … with lots of tea breaks in between! My friend Joe and I bought this bull together. We both have females and needed Solomon’s services. He will spend time at both farms. 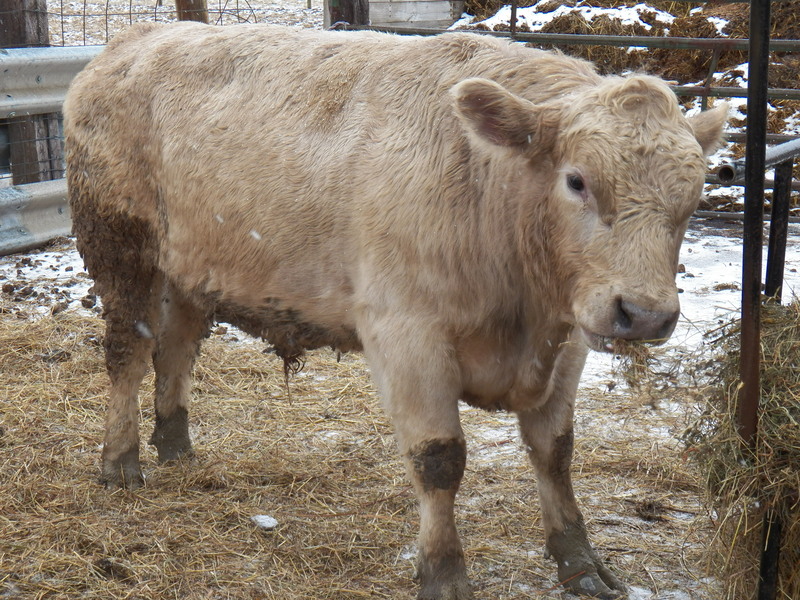 He is a registered Murry Gray bull. He will bring great “grassfed” genetics to our herds, along with the “tenderness gene” found in the Murry Gray breed. There is peace of mind knowing that when it comes to breeding, Solomon has them “covered” 😮 He will take care of that job, freeing me up from watching for signs of heat in the heifers. I got enough to do. I am sure he will enjoy that job more than I do anyway! Sows have had litters of pigs. The piglet survival rate among the new mothers is not what I had hoped. The weather played a small part, but farrowing in nests requires great mothers and just like humans… not every mom is a great one. Sadly, a couple of girls will be culled. It’s all part of farming, but not my favorite part. Our bull came to us with lots of manure and mud caked on him. He seems to be enjoying the three sided shed, filled with dry bedding more than the other cattle. I guess they just think it’s supposed to be that way. He on the other hand, can be found basking in the sun, chewing his cud, very content in the warm dry shed. The farm is very quiet and pretty lonely without my pal King. I find myself looking for him at times, but missing him a great deal. I have no desire for another canine companion, at least for now. I want to just imagine him and my Border Collie Lucy, romping and playing, watching me as I go about my work. I sure do miss my friends. The year has started off with a snowy blast. It has been winterlike since mid-October. I don’t mind, I like the snow. It does help that most of the work was done before it started coming, I will say that. A big , cold, winter storm is forecast to hit us over the next few days. I am working steady to prepare for it. The large sow nests, need to be cleaned partially out and refilled with clean dry straw. That job will fill most of my day. All the barns will get cleaned and bedded…nothing says comfort like a nice warm bed! The sheep have been grazing the paddock where our sugarhouse is located. They have been enjoying stockpiled grass since Christmas day. 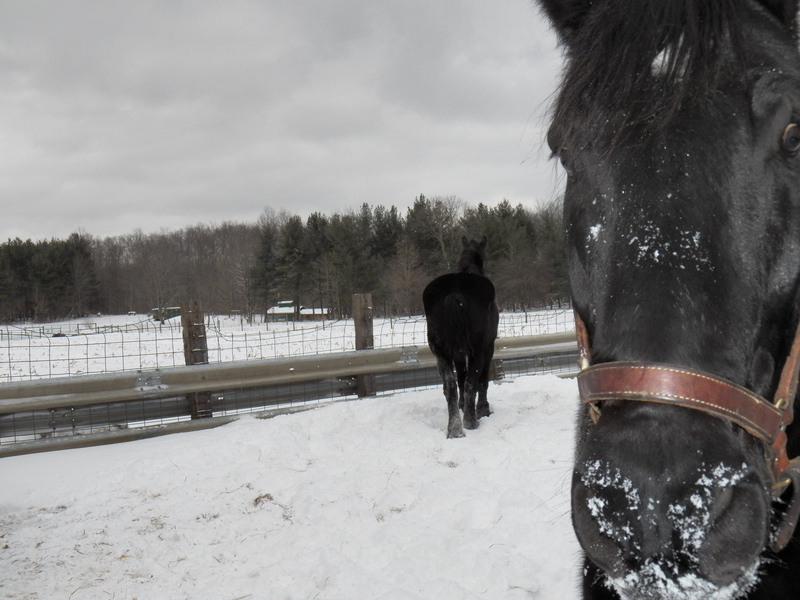 They refuse to eat a bite of hay, choosing instead, to munch the soft autumn grasses hidden just under the snow. The cows are eating lots of hay. The hay helps them stay warm as they digest it. I give them plenty and mix in bales from different fields, even offering a bale of oats now and then. They seem to enjoy the diversity and it makes me feel good to see them enjoy their food.